Summary: “There was a hand in the darkness, and it held a knife.” So begins 2009 Newberry Medal winner The Graveyard Book. In this book a toddler wanders away from home, and the man sent to kill him and his family, and enters a local graveyard. There he is adopted by the…..residents (ghosts), given the name Nobody (Bod) and given the freedom of the graveyard which allows him to do as they do even while he is alive. His new parents and the rest of the inhabitants want him to be safe and while Bod resides there he is. But Bod is a growing boy and curious about the outside world. He encounters many adventures with ghouls, ancient Celtic burial mounds, bullies in school, a Hound of God, and his guardian, Silas, who is much more than he appears. And through the whole book there is a man named Jack searching for him, looking to finish the job he began long ago. When one finishes the book, there might even be a tear in the eye (not that I know anything about that). This is a thrilling and fun book for children who are in fifth grade and above. Adults will enjoy it as well. The illustrations provide a nice touch of guidance for the imagination into how the characters look and sometimes act. Literary: This book is fantasy/realistic fiction. It is clearly fantasy with the ghost, ghouls, Hounds of God, vampires, etc. There is magic and old, old organizations afoot with agendas that are not healthy for Bod. But it also takes place in this world and in this time. The school Bod attends is instantly recognizable to any student. Bod’s friend Scarlett is a typical teenager whose mother “doesn’t get her”. Parents will empathize with Bod’s adoptive parents, the Owens, and the other inhabitants of the graveyard who want to keep him safe. There are lighthearted moments that can turn into heartbreaking ones in an instant. Life and death are treated with respect and with a gentle toughness as well. Also, if one sees similarities with The Jungle Books by Kipling, one is correct. Gaiman acknowledges the debt he owes to those books and encourages those who have not read them to do so. The Harper paperback copy contains Gaiman’s acceptance speech for the Newberry and is worth reading to understand his thinking behind this book. Race/Gender/Culture/Economics/Ability: This book takes place in an unnamed city in England. Issues of race, gender and culture are handled quite well. There is mention of skin color only in relation to one person’s being darker than another. The female characters are strong and worth knowing, especially Eliza the witch. 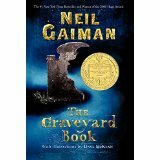 As for culture, Gaiman does a great job blending the cultures of all the inhabitants of the graveyard together (from Roman times to the early 20th century) to help teach and care for Bod. As for ability, Bod is no shrinking violet. He stays out of the limelight, but when he believes it is needed, he becomes a fighter with wits and strength he sometimes did not know he had. Theological conversation starters: One conversation to have with this book is how we in the Church bring different qualities to help care for one another. Each of the inhabitants of the graveyard wants the best for Bod and they teach him how to, hopefully, take care of himself in life. One can ask how those in the church family contribute to help one another. Another is Bod’s adventures. He makes mistakes and learns from them. One can illustrate different characters in the Bible who did the same things. Early in the book Bod gets himself in trouble by falling in with the wrong group. How do we do the same in our lives? What does family mean? How is this shown in the book? Bod takes on a couple of bullies in school. Why does he and how would God want us to act in the same situation? Do you believe Bod’s actions were justified? Why or why not? What does evil look like? A ghoul, a vampire, Mr. Frost? Why do you think some things that are evil look good? Bod goes into the world on his own. Why was it bittersweet for all those involved, from Bod’s parents, to Silas, to Liza, to the other inhabitants? The Graveyard Book by Storypath is licensed under a Creative Commons Attribution-NonCommercial 4.0 International License.